The Apple Store's website, advertising its launch next week, bears the statement "Cosa farai domani, Milano?" which translates to "What will you do tomorrow, Milan?" Suggesting artists and designers in Milan "reinvent the future" every day, the page advises Apple asked twenty artists what they would do tomorrow, commissioning them to create new works which Apple calls a "snapshot of the city's creative energy." The pictures shown on the website range from photographs to hand-drawn pieces, and clay models to computer-generated images. Artists and designers involved in the collaboration include designer Karol Sudolski, filmmaker Martina Pastori, photographer Camilla Ferrari, and animator Stefano Colferai, among others. SettleBIT on Twitter shared images of the store as it undergoes its preparations, including the assembly of a large covering for one glass wall depicting the Apple logo. Building site signage shows the "Cosa farai domani, Milano?" statement, with each piece of art used to represent each letter of the sentence. The page also promotes upcoming Today At Apple sessions occurring after its launch. A concert by LIM will be held on opening day, while sessions in following days include self-portrait creation with Olimpia Zagnoli, photography with Piotr Niepsuj, and artistry with Burrnd. 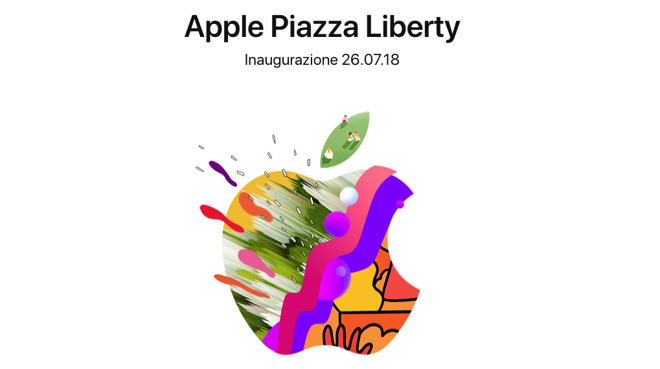 Apple retail head Angela Ahrendts recently advised of the Apple Piazza Liberty store opening on July 26, with the retail outlet set to be open 24-hours a day, similar to the Fifth Avenue store in New York City. It is unclear if Ahrendts will be in attendance for the opening.